The wolves who dress as sheep have issued a warning to their flock: Grace can become a dangerous doctrine and lead people into more sin. The red flags should be flying high whenever a believer hears such misguided teaching that would suggest grace encourages people to sin unless balanced with portions of the law and commandments. 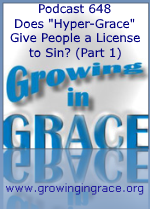 It’s a myth and a fable to think that grace will encourage sin, while a modernized version of the Mosaic law will decrease sin. Those who make such proclamations are providing church folks with teaching for their “itching ears.” The gospel teaches us quite the opposite… the law and commandments brought an increase in sin - and sin ABOUNDED under a system of works. But grace ABOUNDED all the more and it’s through grace that we reign through righteousness. The word "abounded" in the Greek is where we get our English word for hyper and it means to overflow beyond measure, exceeding what is needed. Jesus was grace manifested. He never encourages people to sin. Grace teaches and trains us to live godly in Christ Jesus - it empowers us to live in righteousness. Can we have too much of Jesus? Of course not. But this is what hyper-legalists are implying, and that’s the dangerous teaching we should be running from.